Formally known as the ribbing stitch, it is also known as rib, or ribbed stitch. It is the stitch often seen on the cuff of sweater sleeves, or at the top of a sock. The ribbing stitch makes the knit stretchier and can be placed anywhere on a garment that you want a slightly snugger fit. 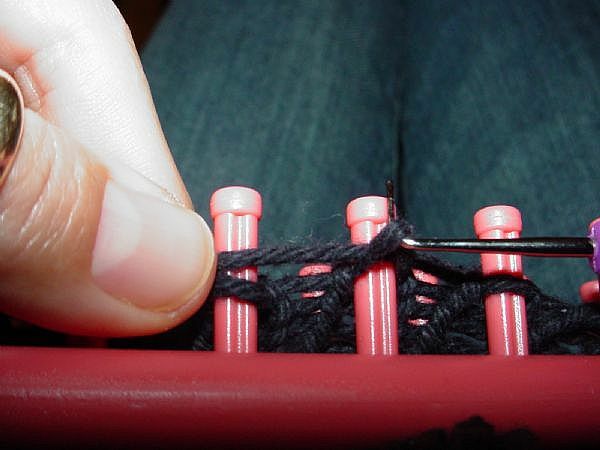 The ribbing stitch can be made on any Knifty Knitter loom (round or long) simply by alternating the knit and purl stitches. It's simple enough for the beginner to loom knitting. If you want to make terrific patterns on the Knifty Knitter looms, you'll want to learn this stitch. You can create a variation of the ribbing stitch by knitting twice and purling twice, or knitting once and purling twice, etc. The idea is simply to alternate the two stitches in a continuous pattern around the loom making a snugger fitting knit. 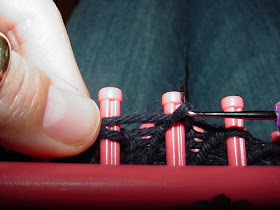 The last step of the purl is to grasp the loop created above between the finger and the thumb. Use it to lift the existing loop up and off the peg. Replace the previous loop on the peg with the new loop in your grasp.